Chandigarh, April 15 (IANS) Pro-Khalistan group ‘Sikhs For Justice (SFJ)’ has claimed that the Pakistan government has banned the registration of the ‘Khalistan Referendum Team 2020’ on its soil at the behest of the Narendra Modi government. 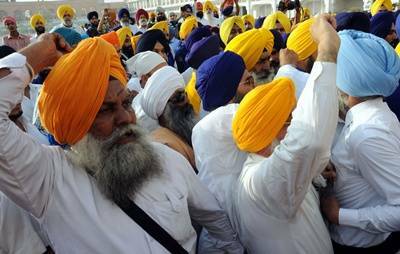 "Prime Minister Imran Khan and (Pakistan) Army Chief (Qamar Javed) Bajwa, who have been deceptively claiming to be the messiah of the Sikh community have succumbed and bowed down to Modi government’s dictatorial pressure to ban SFJ’s ‘Khalistan Referendum Team 2020’ registration event at Panja Sahib during the visiting Sikh pilgrims from India," Pannun said. Punjab Chief Minister Amarinder Singh has been critical of the SFJ saying that it is a "one-man army caked by Pakistan’s ISI" (Inter-Services Intelligence). "Pakistan Army and ISI have treaded the path of alienating the global Sikh community who have continuously supported Pakistan during India’s threat of jingoistic war," Pannun said. Reiterating that ‘Punjab Independence Referendum 2020’ is a democratic campaign for "right to self-determination through ballot not bullet", he claimed that SFJ’s global peaceful movement was being undermined by the Pakistan government.